Learn how to track your invoices in Costlocker and how it can help you see and evaluate the coming months. As of now, Costlocker can’t create invoices and send them to the client. What it can do however, is keep track of your billing, so you can always keep an eye on your cash flow. Everything related to project billing can be found under the Billing tab in any project page. 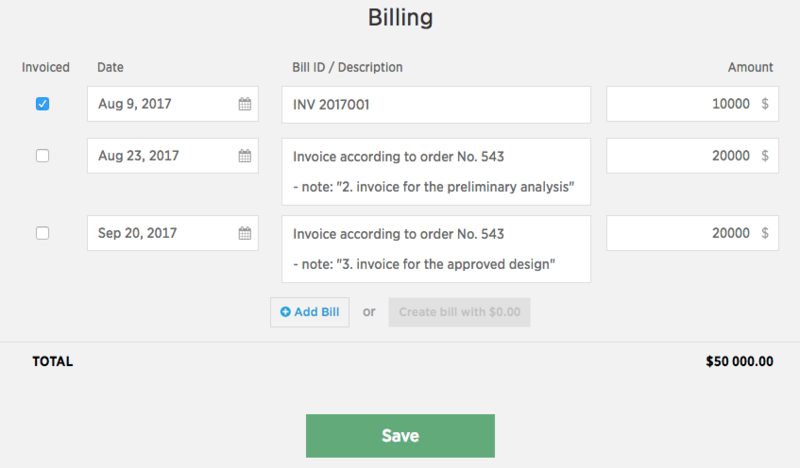 As soon as you create an invoice in your preferred application, enter the data into the project’s Billing tab. In the Overview tab of the project page, you’ll always see how much of the total project price has already been invoiced (Billed to date). If you agreed to invoice the project in several installments, enter what should be invoiced and when. Leave the Invoiced field empty, if the item hasn’t been invoiced yet – whoever will be billing the item will check this filed later when it’s done. Enter the expected date of billing into the Date field – this is often related to a milestone in the project timeline. Leave any information necessary for whoever will be billing the item in the Bill ID / Description field. This can include e.g. where they can find the order or what they should confirm before billing. Read more: Billing outlook or what you’re going to invoice in the following months.